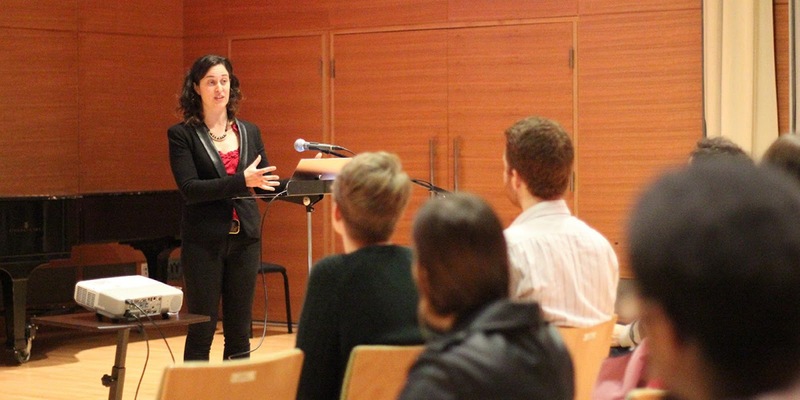 Chloe Veltman, Senior Arts Editor at KQED, visited SFCM early this February to give a talk titled “How to Get Noticed” to set the business mindset that students need as they develop programs and concert series of their own. 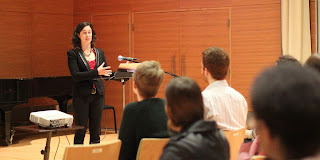 Over her career, Veltman has contributed to media outlets including The New York Times, Los Angeles Times, and The Wall Street Journal, in addition to authoring the blog lies like truth, and worked as an associate producer and screenwriter for Keeping Score with Michael Tilson Thomas and the San Francisco Symphony. Veltman did not suggest doing away with the old, but simply recommended changing at least one aspect of the performance. She explained that no matter what one’s political views are, it is a crucial aspect of the artist’s life to be a part of the dialogue between the world around you, the press, and the audience. Changing the frame can be anything from bringing classical music to the people in schools or public parks, to holding a benefit concert, to prominently featuring female or Muslim composers, to composing a work in reaction to the world around you. Student Andrew Grishaw ’17 attended the talk and said, "The talk that Chloe Veltman gave was intriguing because of the connection she made between the arts and the political climate. Specially, we spoke about how to connect to all sides of the political spectrum through the work that we do. This is something I believe is vital to the improvement of our communities and our nation."